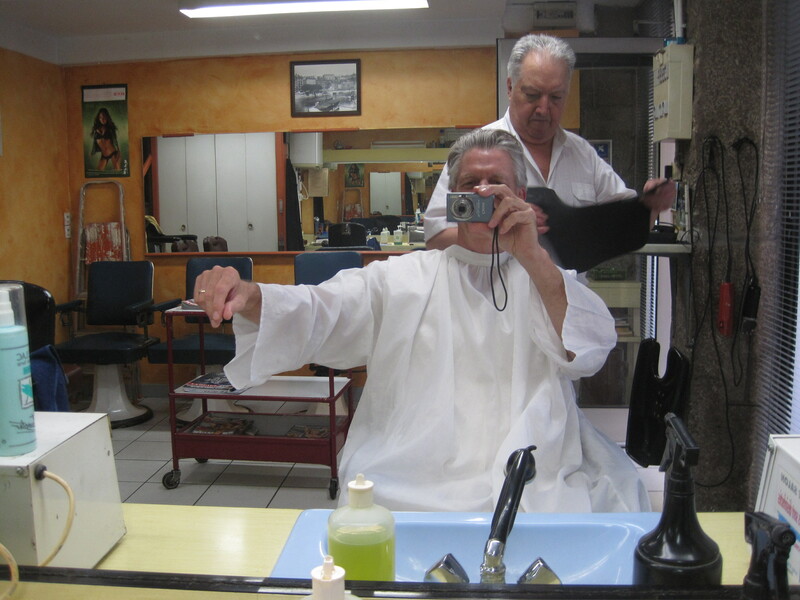 Committed to living on the dazzling edge of intuition and spontaneity, I instinctively veered to the right, and found myself standing in the doorway, face to face with Henri B. I didn’t really need a haircut, but the spirit moved me, so there we stood, in close proximity. 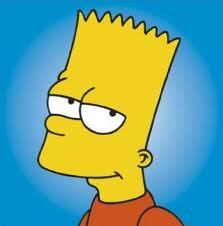 He was a pleasant man with a gentle demeanor, but spoke no English whatsoever, nor did he want to try. Mostly, we agreed to talk intermittently without any overriding need to understand each other. My gestural description of what my hair needed was, “Leave the sides full, but cut the top down considerably.” It’s no secret to those of you who know me, that my hair tends to grow straight up like Bart Simpson’s, so I have to continuously mow the top down to keep from appearing to be over 7 feet tall. 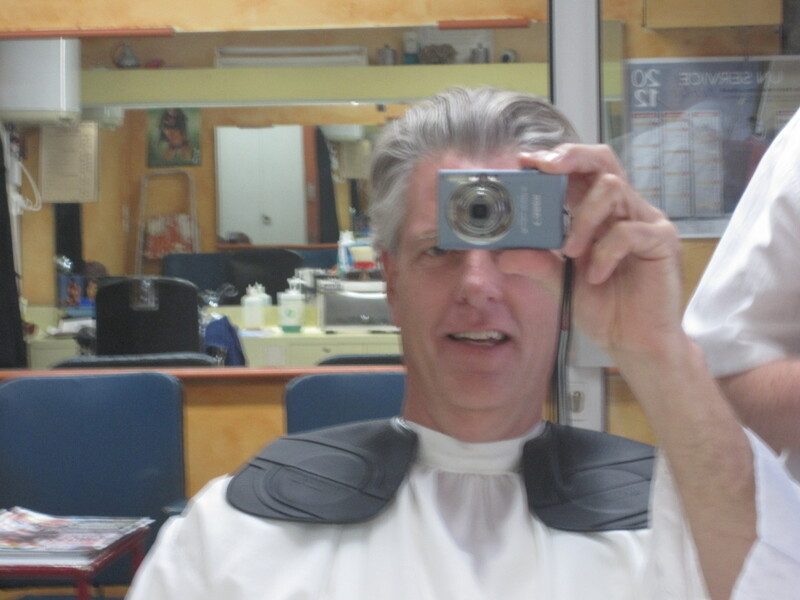 Consequently, the prospect of both minimizing my height, and having my first haircut in France made for a very exciting morning indeed. Even though trying to act cool and nonchalant, I must admit that I was feeling a bit giddy. Henri started by swirling the apron over my head with a bit of an artistic flair, however, he was displeased when I didn’t do my part. What? I wanted to help, but was confused about what he was trying to say. As it turns out, there were actual sleeves in his barber-cape, which was a delightful new twist for me. I couldn’t resist taking some pictures, and he didn’t seem to mind. 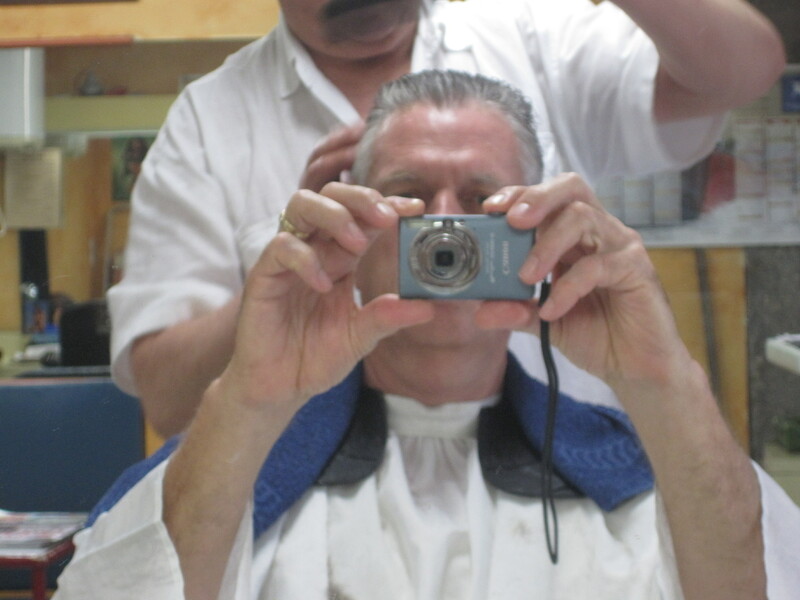 I felt somewhat like a large French angel, or perhaps the newest member of Henri’s barbershop quartet. His next move was to install the black lead-lined collar. Now . . . that step really caught me off-guard. The strange piece of protective gear weighed about 10 pounds, and felt like I was about to undergo some new x-ray barboscopy technique. After that came the blue towel overlay which was really a nice touch—probably just to distract from that alarming black rubber thing. 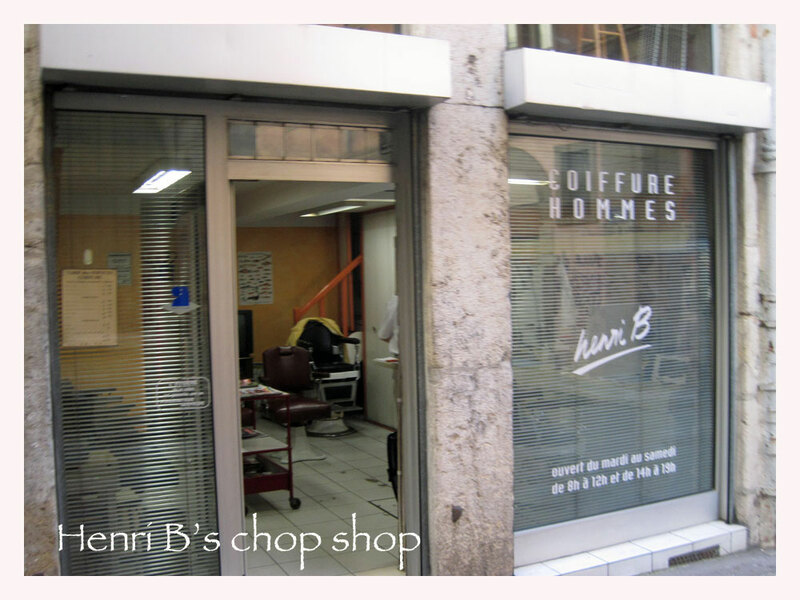 Then, with a deep breath and a moment of silence, Henri began the cutting operations—something I had never experienced before. First, he plugged a heavy industrial-looking black chord into a large breaker box high on the wall with a deliberate motion—as if it was dangerous. Then, he turned on the 1920 model clippers that sounded more like he was going to trim the hedge out front. The noise was so loud, that when he cut around my ears, the decibel level would definitely qualify as a work related injury in the US. Evidently, Henri went to the French school of the “triple threat technique.” First comes the rough cut by swinging the hedge clippers through the air in broad sweeping strokes, catching random clumps of hair in the process. Second, is the use of squeaky scissors to fix the damage from the previous rough cut. The third and final step involves the straight razor, which is evidently used to repair the damage from any unfortunate misuse of the scissors. And that’s exactly how it went down. Needless to say, I was thrilled with my new haircut! Even though he did exactly the opposite of my gestured desires. It was my first “French do,” and I was mighty proud of it. After all was said and done, I was just under 7 feet tall, and I was okay with that. All joking aside . . . it was a wonderful morning in Lyon. 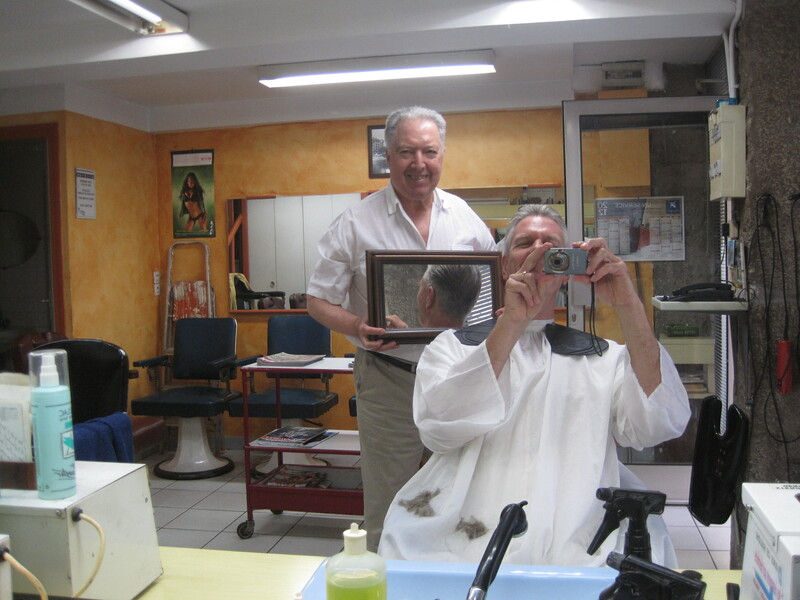 Henri B was a good sport, and without a doubt, it ended up being absolutely the best haircut I’ve ever gotten in France—albeit the only one! Note: You may be interested in some of our other stories about our time in France.